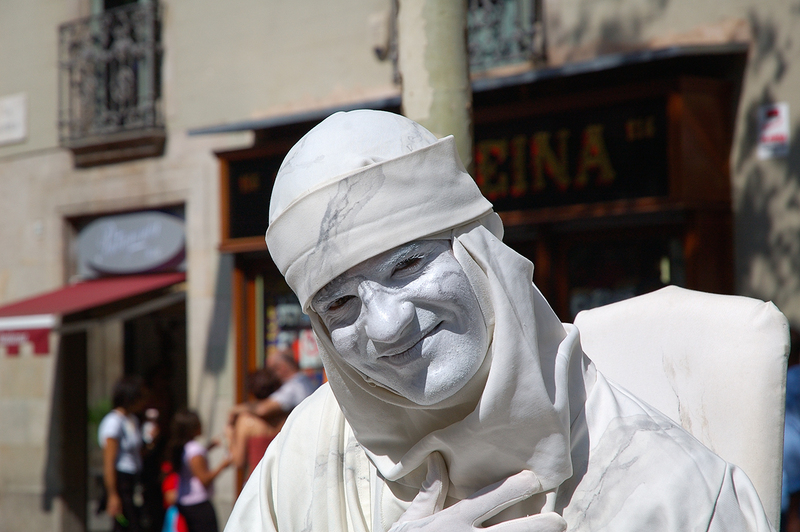 This is for me one of the greatest human statues at Las Ramblas de Barcelona. It was hard to capture white colors properly. As you know the ccd of the camera can be fooled by bright or dark surfaces thus making the picture too white or too dark depending on which surface you focus. The guy was smiling at me after I gave him one euro. Sometimes a picture is worth the money and these street artists really deserve it. Note: Barcelona Photoblog has been invited to be part of Saatchi Gallery Online, a free showcase for photographers and a world leading interactive resource created for the art community. See some of my pictures here at Saatchi Online. Congratulation on the Saatchi invitation. That is a nice recognition! I have been thoroughly enjoying your human statues series. They are all such wonderful photos. Parabéns pelo convite que recebeu, a meu ver merecido. Thanks. Your words compensate for all the night hours awake. Ah, all the night hours awake ... you're right, Carlos. I'm looking forward to a nap on Saturday, maybe one on Sunday, in between working with photos, finding facts to share and trying to add the list of CDPB cities to my blog. What a pleasant smile the young man gave you! I myself gave $2 (I don't know the conversion rate to Euro) to a young man playing the accordion on the corner the other day. It was right after I'd bought the CoolPix; I took his photo and hope to post it at some point. You're right about these cameras; I'd only had the D50 since Christmas, but I'd grown to love its heavy self and to depend on its abilities.